This visualization of the three-dimensional structure of the Pillars of Creation, which lie within the star formation region Messier 16 (also called the Eagle Nebula), is based on new observations of the Pillars using the MUSE instrument on ESO’s Very Large Telescope in Chile. New images provide the first complete 3D view of the Pillars of Creation — some of the most iconic cosmic structures ever studied — and suggest that the glorious protrusions may be around for only another 3 million years. The new images reveal never-before-seen stars in the thick, fingerlike gas clouds, as well as new details about their orientation in space. You can get a close look at the formation in a new video of the Pillars of Creation. The Pillars of Creation gained worldwide fame on Earth when they were imaged by the Hubble Space Telescope in 1995, and in 2014, Hubble used its updated hardware to produce even higher definition images of the region. These cosmic protrusions are composed of dust and gas, and are part of a larger region known as the Eagle Nebula — a fertile region of new star formation. The star cluster NGC 6611 is a product of this area's star-forming tendencies. This colorful view of the iconic Pillars of Creation in the Eagle Nebula was created using the MUSE instrument on the Very Large Telescope in Chile operated by the European Southern Observatory. When hot and massive new stars begin burning in gas clouds like the Eagle Nebula, they give off strong stellar winds and powerful radiation that disperse much of the gas that surrounds them. Denser pockets of gas in these star-forming regions can sometimes withstand the radiation and stellar wind. Such pockets can then act as a shield to the gas that lies behind it. As a result, in these regions of star formation, astronomers often see column-shaped gas structures. These protrusions are sometimes called "tails," "elephant trunks" or in this case "pillars," according to the statement from ESO. The "shield" of the left-most pillar is the upper tip, which the new images show is oriented toward Earth. "This tip is bearing the brunt of the radiation from NGC 6611's stars, and as a result looks brighter to our eyes than the bottom left, middle and right pillars, whose tips are all pointed away from our view," the statement said. The powerful wind and radiation coming from these stars may eventually crumble those shields of dense gas. The new MUSE data has allowed astronomers to measure the rate at which the Pillars of Creation are being destroyed in this way: they lose about 70 times the mass of the sun every million years. 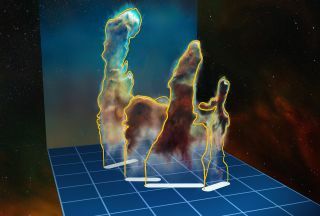 This graphic depicts how the European Southern Observatory's MUSE telescope instrument created its 3D view of the iconic Pillars of Creation in the Eagle Nebula, or Messier 16. The Pillars of Creation are currently estimated to contain about 200 times the mass of the sun. If the current rate of evaporation continues, these gaseous fingers could be completely destroyed in about 3 million years. That is, if the Pillars haven't already been destroyed by a nearby supernova explosion observed in 2007. It's possible the stellar explosion has already wiped out the gas clouds; but, because they are located 7,000 light-years from Earth, astronomers can see them only as they existed 7,000 years ago. The supernova explosion is thought to have taken place between 6,000 and 9,000 years ago, so it may be another 1,000 years before astronomers know if the Pillars are still standing. The new study appeared in the April 30 issue of the journal Monthly Notices of the Royal Astronomical Society.